The new Peugeot 308 comes with a new look, features innovative e-HDi micro-hybrid technology and optimises fuel consumption and CO2 emissions, which start from just 98 g/km. 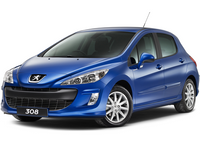 The Peugeot 308 is certainly a fine looking large hatchback that offers good refinement, a stylish and well built interior and a vast range of solid engines in both petrol and diesel. However, critics have stated that it’s too expensive and not as much fun to drive as some of its competition, such as the Ford Focus or Volkswagen Golf.